In all regards, this 72-footer feels like she&apos;s ten feet longer. 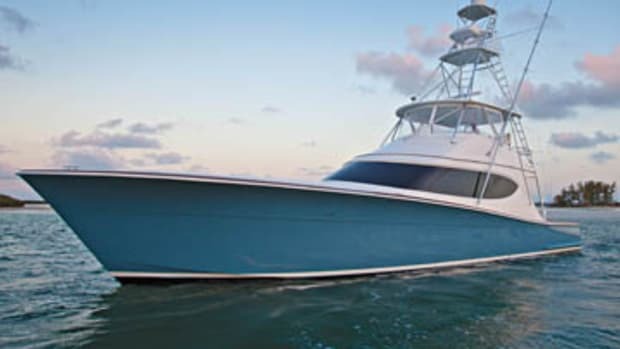 When I stepped through the push-button-activated, stainless steel saloon doors on the Hatteras 72 for the first time I had a creeping feeling of doubt: was I on the right boat? I’d been on more than a few of this builder’s yachts over the years, and this one didn’t mesh with the cream-carpeted, modern-condominium styling I’d come to expect. Instead, the dark wenge flooring, sharp angles, china closet with glass panes, egg-shell-color couches, and mahogany bar with orange stools looked—dare I say?—Italian. But with a welcoming handshake and North Carolinian drawl, company captain Scott Rudisill assured me that I had boarded the correct vessel. “It’s upgraded,” he explained with a grin. Following me through the doorway, MarineMax representative Steve Gale, whose company is responsible for brokerage of larger Hatteras yachts in South Florida explained, “There are lots of optional upgrades on this boat.” My intuition about the styling influences was right: Hatteras calls this particular interior its “Tuscany Scheme.” But the best part was that the even though this was not a typical Hatteras dcor (which is still standard), the fit and finish was the same—superb—and could have come from any of the leading European yards. As I leaned against the rectangular eight-person dining table staring out through massive picture windows to either side, that eerie feeling that I was on the wrong boat returned. Trying to explain it, I feigned ignorance and asked, “What’s her length again?” “Seventy-two feet,” replied Rudisill. She felt bigger than that, and I told him so. “It’s her beam,” he agreed. “It’s 20&apos;2".” With that, I realized why the uncanny feeling; this boat has about the same length to beam ratio as the Hatteras 80. The finish and the interior dcor make great use of the added volume and help give this vessel the feel of a megayacht. Walking forward, past the optional dayhead to starboard and into the galley, I was impressed again, this time by the high-end gear and well-planned layout. The L-shape counter to port was covered in optional granite, as was the galley island, which concealed an optional Whirlpool trash compactor. A two-door Sub-Zero ‘fridge and freezer, GE Profile microwave, Kitchen Aid cooktop, Whirlpool oven, and Fisher & Paykel drawer-style dishwasher were all upgrades, as were the custom cabinets and mahogany valances above the three forward-facing windows. In lieu of a lower-helm station there was an elevated breakfast nook, the perfect place to stretch out and read in the deluge of natural light. I climbed the steps to starboard as we prepared to leave to dock and discovered that part of that megayacht feel was due to the optional flying-bridge hardtop, with its integrated windshield and electronically retractable sunroof. P&R Canvas windows, a mix of solid EZ2CY panels and flexible Strataglass, enclosed the area, allowing four optional air handlers to fill the space with 32,000-Btus of frosty breeze, not that being both cool and dry are features exclusive to a megayacht, although it sure adds to the ambiance. And so does a 5&apos;6"-long bar with rounded black-granite countertop and three fixed barstools. 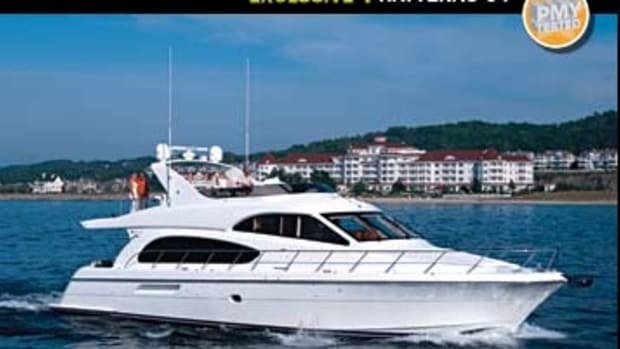 But what really gives the 72 a big-boat feel up here is the extra floor space: thanks to an uncluttered, simple arrangement, the area can comfortably seat 15 people while leaving unfettered mingling room for at least 30 more, making this an ideal place to entertain. If you want to extend the interior dcor below to this area, Hatteras offers the option of making this a true skylounge, with a carpet, entertainment center, and all the amenities. As I eased into the companion Pompanette helm chair to take some notes, Rudisill asked if I wouldn’t mind dropping a few lines so we could depart. This is where another example of the 72’s megayacht feel became apparent. Before I headed down the steps to the main deck, I observed that the only good sightlines from up here were towards the bow; the flying-bridge overhang, holding a 1,500-pound-capacity Steelhead davit, obscures the aft area and swim platform. Once I was on the side decks, I was unable to communicate with Rudisill, so just like on the big boats, a few clip-on radios would have been necessary for any tricky maneuvering. 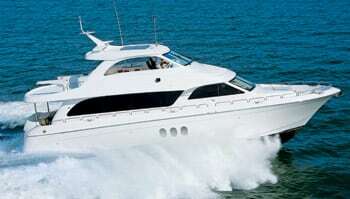 With them, a well-coordinated crew of two could easily handle this vessel. Exiting her slip, maneuvering was aided by the Slow Vessel Mode (SVM) built into the Caterpillar electronic controls. It allows you to use full lever travel at slow speed, providing better throttle modulation around pilings and docks. That was a good thing since the rubrail on the 72 was a bit too high to protect the hull from the docks and pilings. 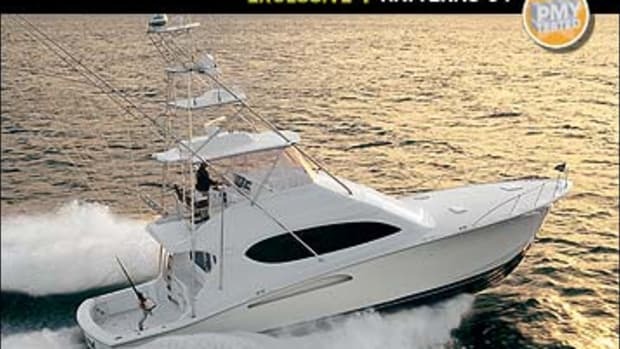 However, just like most larger motoryachts, even with SVM, the 72 responds rather leisurely to helm input, at least compared to a sportfisherman. Once the standard American Bow Thruster bow and optional stern thrusters were activated, it took a couple of seconds for the boat to move, after which she came around nicely. Any good captain or experienced owner should have no trouble getting this 160,000-pounder in and out of slips. Indeed, with crew quarters like these, a good captain shouldn’t be hard to attract. You enter them through the transom door or via a staircase behind the bar in the saloon. The stateroom to port fits a queen bed, while the entire starboard side is given over to a head with a roomy shower. The stacked washer-dryer is just for the crew (side-by-side units in the hallway between the VIP and master staterooms forward are for owners and guests). Another big plus for a potential captain is the brightly lit and easily navigable engine room. Every item—with the exception of the chillers, which are behind the starboard exhaust—is easy to access, intuitively placed, and clearly labeled. 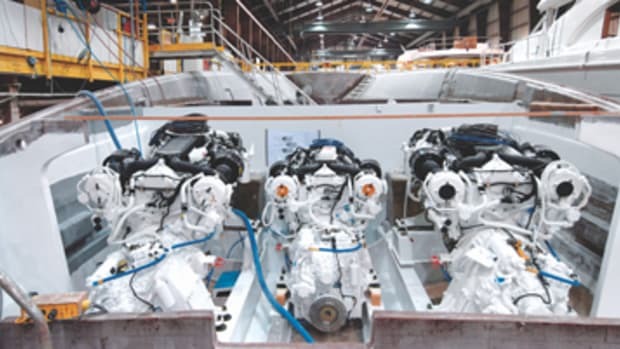 But actually, one of the smartest features in the engine room is controlled from the helm. With the flip of a switch, you can transfer fuel while you’re underway, a handy way to alter trim. Since the tanks have automatic shut-offs, there won’t be any fumes or spillage if you forget to turn them off. When we left Hillsboro Inlet near Pompano Beach, Florida, the twin 1,800-bhp Caterpillar C32 ACERTs, which are raised slightly at the forward end to preclude the use of down-angle marine gears, pushed our test boat to a top speed of 29.3 mph (25.5 knots). Two- to four-foot seas slipped under our bow without even the hint of a jostle, and with the optional ABT Trac stabilizers activated, the ride was silky smooth, even when we ran back over our own wake. “It’s really something,” said Gale, and I concurred without reservation. The larger reason for the comfortable ride is Hatteras’ proprietary running surface. The 72’s hull is similar to its 77 Convertible. It’s resin-infused with a warped bottom with a convex entry that flattens out into a planing surface aft and tunnels for the 41x72 Michgian props. 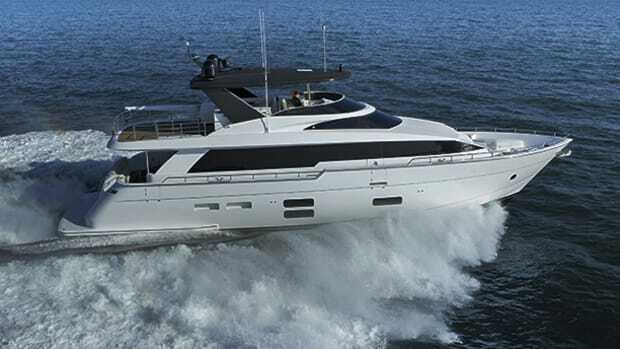 And as an interesting side note: unlike the 80-foot Hatteras motoryacht, which was designed by independent naval architect Gregory Marshall, the 72 was created entirely in house. During my helm time, the 72 handled smartly, making sweeping three- to four-boat-length-diameter circles with the wheel hard over and a maximum rudder angle of 28 degrees. 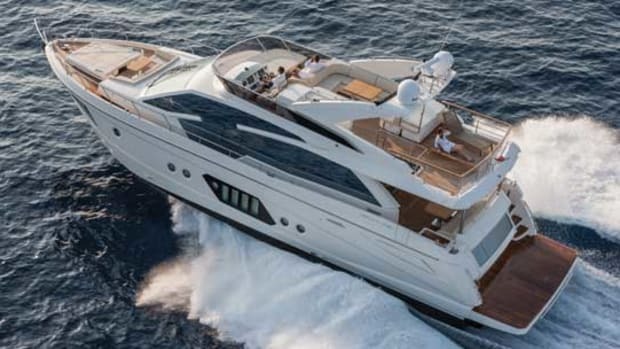 Admittedly, her reaction to wheel input was slower than that of one of her convertible sisterships—no surprise there—but at 72 feet, she’s relatively agile for her mass. 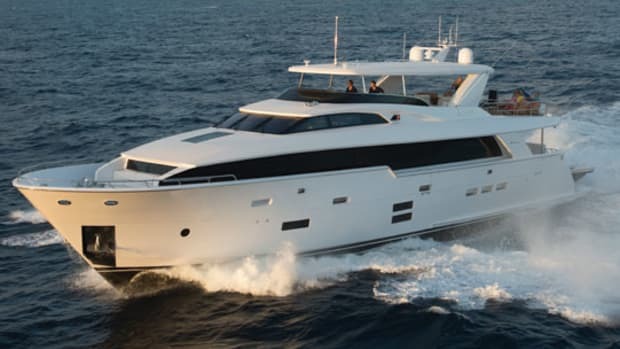 If you’re done running your own boat, or are ready to step up into something with more space and elegance, you might consider giving the 72 a sea trial. She’s a great example of how to maximize onboard space. Indeed, that extra beam makes this feel like a mini-megayacht, and that alone may make you feel like you stepped onto exactly the right boat. 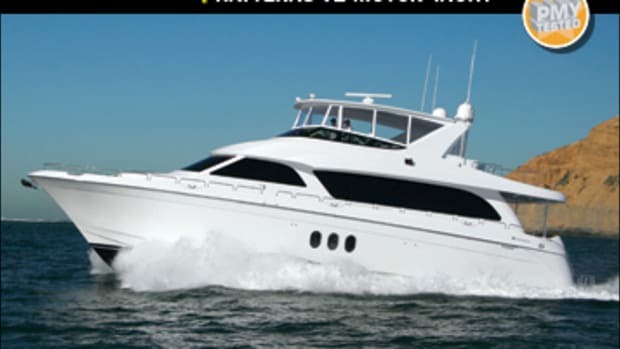 Hatteras Yachts (252) 633-3101. www.powerandmotoryacht.com/hatteras/..